Traditionally, when we think of load testing we mean an entirely internal test. You send a large number of virtual users at your site or application to see how it performs. But everything happens behind your firewall. The calls are coming from inside the house. An internal load test can tell you how well your application or site handles an increase in traffic. But it doesn’t reflect real world conditions. With an internal test, you control the entire environment. Your production environment is anything but controlled. Your users access your site from different locations, using different browsers and operating systems, while dealing with differing connection speeds. This means that if you only run internal load tests, you may end up with a nasty surprise when you go into production. That’s not to say that internal load testing is useless. But it is incomplete. An external load test will make your load testing much more thorough and accurate. You’ve got some quick and dirty options if you’re low on budget and time. Free online website performance tools can let you send traffic to your site from servers all over the world. Tools like these can only send traffic to one URL and won’t simulate the heavy traffic you need for a full load test. But they can let you know if your site or application takes too long to load when accessed from certain regions in the world using various platforms. Discovering that your site doesn’t play well with certain web browsers lets you head off significant problems before you go into production. Let’s assume that you have plenty of test scripts from functional testing that you can reuse for load testing. Let’s also assume you know how many users you expect on your busiest day and that you’re clever enough to load test for even heavier traffic than that. All you need now is an external load testing tool. 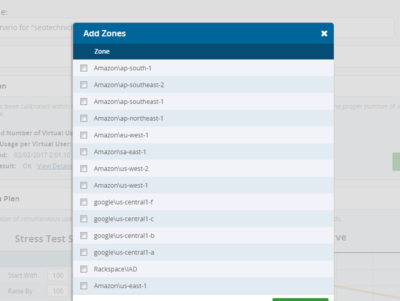 These tools use cloud-based servers to send virtual traffic to your website or application from all around the world – or just from the regions where your target customers reside. With a tool like Dotcom-Monitor’s LoadView, you can run an exhaustive external load test. You record your test scripts, specify which platforms and browsers your customers use (don’t forget mobile! ), and select the areas of the world you want your virtual visitors to originate from. With a cloud-based SaaS (software as a service) solution such as LoadView, you only pay for the server time you use. The more virtual users there are in your test, the more the test will cost. Don’t skimp on virtual traffic just to save a few bucks. No external load test will cost more than the lost revenue you’ll face if your site slows down significantly on Black Friday. Or the bad publicity you’ll get if potential customers lose interest while waiting to read all about your big product launch. How Often Should You Perform External Load Testing? An external load test isn’t just about server and connection speed. New code can lead to an avalanche of errors that slows everything down. Best practices include performing external load testing with every update or release. At a bare minimum, you should do external load testing a few months before your big traffic days (like Cyber Monday) so you have time to address any issues you discover before the big day.